As the President at Technical Multimedia Design (TechMDi) in Burbank, California, David Revel has a wealth of experience in the design of Audio and Video systems, Control Systems and Integrated Network Infrastructure. He has worldwide experience in the architecture, implementation and deployment of audio and video systems that push the cutting edge of digital signal processing and networked distribution and control. The breadth and depth of David’s projects and work experience provides a unique combination of technical expertise with an intimate understanding of the needs of the end user. 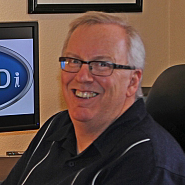 David has been a professional audio engineer for over 30 years. After studying Chemistry and Music at UC San Diego, he worked as an audio mixing engineer on a diverse range of live events and recording sessions, including work with such notable artists as Lee Ritenour, David Grusin, Chick Corea, GRP Records, Chaka Khan, The Metropolitan Opera, and the New York Philharmonic Orchestra. Working as a consultant to the entertainment, broadcast and presentation industries, David has developed network based audio systems for facilities in all corners of the globe. David’s work as a consultant has covered the entire design cycle, from conceptual and schematic design, through design development and systems assembly, field installation, integration and loudspeaker systems tuning.